View More In Umbrella Stands & Bases. This heavy duty umbrella Base Weight Bag is with 900D polyester material, it helps to keep your umbrella stands stable in gust weather, protecting the umbrella and safety of your family and friends. Simple to fill the sand with a big opening on the top of the weight bag. Easy to move the weights bag with 2 Sturdy Handles, and the buckle help to fasten and focus the weight on your umbrella stand base. Better looking with your umbrella stands, enhance your taste in the eyes of your friends. This Weight base for offset umbrella is made of high quality durable material---900D polyester with industrial level standard, not easy to tear up, broken or leaking. 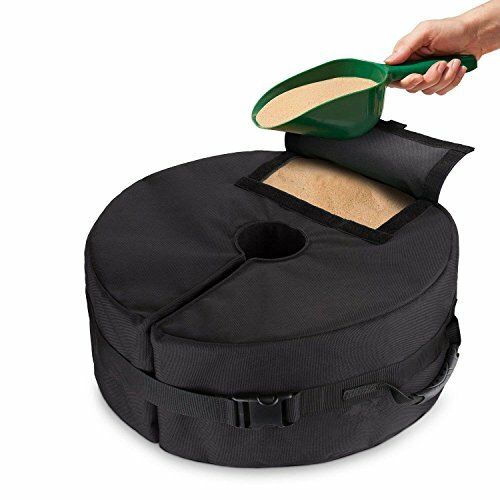 The round weight bag is also easy to fill with sand or pebbles from the big opening, with a buckle to fasten up, it helps to keep the weight focus on the stand. The sand bag is simple to set up, you can clear the sand and fold up to carry after use. The weight bag is 18" diameter and 7" Height design. Each piece of this Umbrella Sand Bags can hold up to 33 lbs when fully filled with sands. Heavy Duty Outdoor Umbrella Base Weight Bag, Prevent your umbrella from tipping over and your family from injuring even when it's extremely windy and gusty. If you have any questions about this product by VOLMON, contact us by completing and submitting the form below. If you are looking for a specif part number, please include it with your message.